1/3/11 – Acquisition – Haarlem, Frans Hals Museum – On 27 January 2011,the Frans Hals Museum acquired a painting by Salomon de Bray representing The Queen of Sheba in front of Solomon’s Temple in Jerusalem (ill.) at Sotheby’s New York for $194.000 (including charges). No doubt a student of Pieter Lastman, after having settled early on in Haarlem, Salomon de Bray was one of the best historical painters before Rembrandt. One of his masterpieces is considered to be Young Woman Combing her Hair acquired about fifteen years ago by the Musée du Louvre. The painting purchased here by the Frans Hals Museum is very different from the artist’s generally known production. This interior view of a temple, where an imaginary architecture  eclipses the scene itself, reminds us that the artist was also an architect. He designed projects, for example, for the Haarlem City Hall and published Architectura Moderna, a volume of engravings after buildings constructed by Hendrick de Keyser. There is only one other known painting  which might be comparable, View of a Temple (whereabouts unknown). The action here is obviously less important and seems anecdotal, with the figures appearing to be almost puppets in this particularly imposing décor. 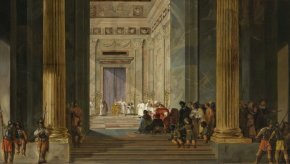 The Queen of Sheba is seen kneeling while Solomon, on her right, is standing, clothed in a red robe and the high priest officiates from the back of the temple. Although the Haarlem museum owns several works by Jan de Bray, Salomon’s son, it held only one other one by the father until now, Leda Showing Helen to Tyndareus. Interestingly enough, it belonged to Charles de Wailly in the 18th century. According to the Sotheby’s catalogue entry.